A couple posts back, I shared some of Justyn Smith’s photos of some products River ValleyChurch produced based on the Go Kids artwork I created. After my wife saw all of the cool stuff, she said she’d like some of it and so I asked Justyn where we could purchase some of it. He was so kind as to ask for my address and offer to send us a box of goodies. Well, the swag arrived last week! Here’s a few pics of all the cool stuff Justyn sent us – Thanks, Justyn! Plain Joe Studios commissioned me to illustrate a children’s book, Cyndy Squirrel’s Change Of Heart, in 2016. The book was written by Justyn Smith and Aaron Cole for the River ValleyChurch children’s ministry, Go Kids. Plain Joe Studios commissioned me to illustrate a children’s book, Carlos Comes Home, for River Valley Church in 2015. The book was written by Justyn Smith and Monica Morgan for the River Valley Church Go Kids children’s ministry. 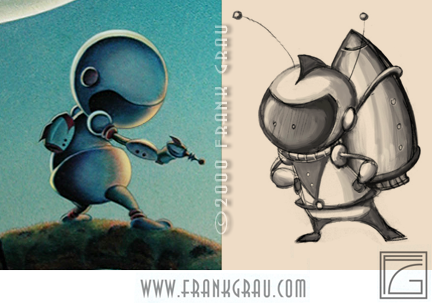 Few illustrations are done without preliminary brainstorming. Some begin as sloppy little doodles done on anything from napkins, to envelopes, to whatever scrap of paper is handy when an idea comes around. 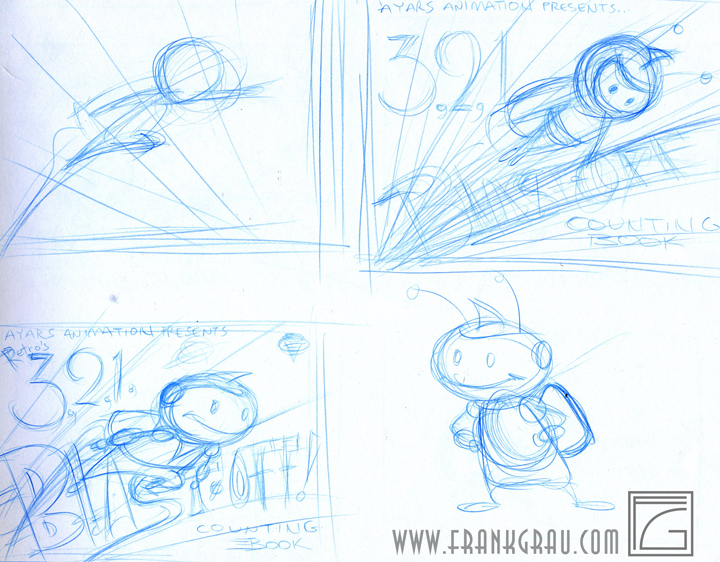 On top is the thumbnail that served as the basis for the final drawing. below that is the final menu page illustration. Sometimes I’ll spend time on a rough sketch, and other times I just want to come up with some very rough compositional idea, so I’ll noodle around with sloppy little thumbnails. These aren’t the kinds of things many artists want you to see, because they’re not pretty, and, in fact, are embarrassingly bad from a rendering point of view. But their purpose isn’t to look pretty, so don’t judge them too harshly. Furthermore, when time is critical, I’m even less inclined to draw anything beyond chicken-scratches. Yes, many have been horrified to find, after selecting me to be on their Pictionary team (in hopes that having an artist on their team would ensure a landslide victory), that I draw sloppy little stick figures just like anyone else. 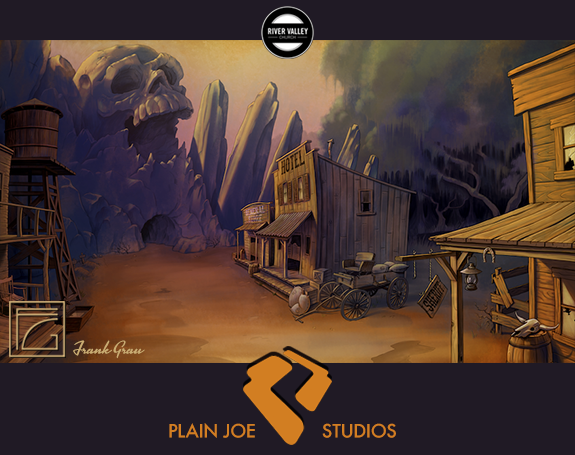 Around the beginning of May of 2012, because the current project at Ayars Animation was a bit ambitious and was taking far longer to finish than we had hoped, Frank Ayars and I discussed the idea of doing smaller projects. I suggested that I take a week or two off so that I might attempt to complete an entire picture book in that time. If you knew me, you’d know that’s pretty ambitious; not because I illustrate slowly, but because I tend to get bogged down in the minutiae of a picture, and I spend far too much time in details that can hardly be appreciated by anyone. 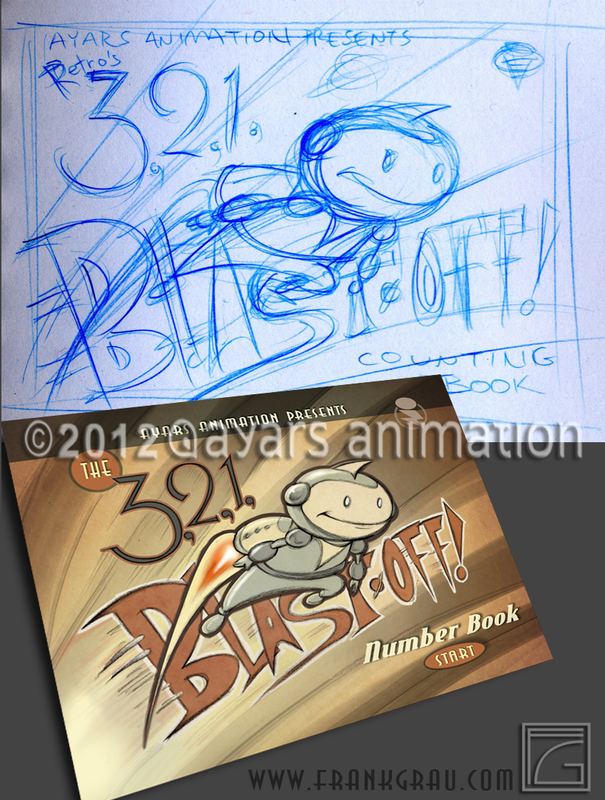 So I decided to do a book with, what would be for me, a rough illustrated style. Basically, this meant I’d do a fast color over an acceptably clean drawing. It’s actually what a lot of printed children’s books already look like, so we’re not talking about rushed or bad art. I just wouldn’t take the time to make it too polished. The irony is, I often tend to refine all the charm out of my looser drawings, so illustrating a book this way could actually render pretty good results. Overall, I had to come up with a character, write the text, and illustrate it in a format which I could then hand over to Frank Ayars for implementation. I also put together a small pdf with storyboards and instructions on how the app-user interactions might work, how the articulated characters would move, etc. I also had to design any necessary navigation items and such. I think I spent a couple of days just thinking of what to write, bouncing ideas off my wife, and receiving creative input from my oldest daughter. 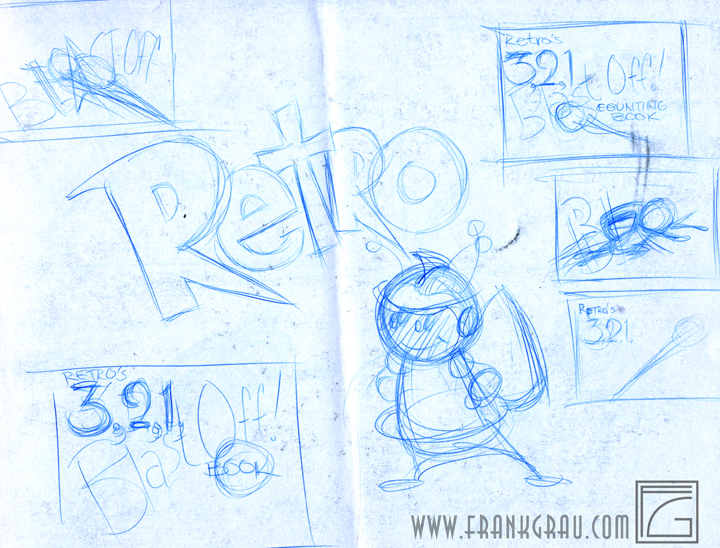 After that, I began noodling around with the design of the menu page. 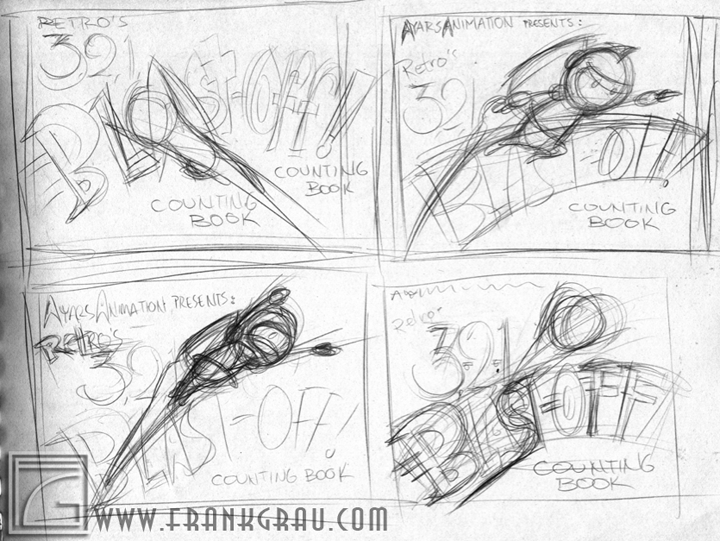 The thumbnails you see in this post were made while working out a composition for the menu page of the app. I designed the character of Retro loosely off of the two other characters you see here, which I had created around 2000 A.D. (I added “A.D.” so readers don’t confuse it with some other year 2000). The one character on the left was a character called The Flooglemop, about which I had actually began writing a story way back, as well. I was writing that story all in verse, and I realized how stupid a decision I had made in attempting to write such a long story that way, so it never saw completion. The other character was just a doodle done for fun. Though the entire book app is done in a very loose style, it actually turned out quite nice. For the record, from the decision to embark on the project to the time I handed off all the completed assets to Frank Ayars, it was about ten days. It was nonstop work, and I felt like I had given birth, only without the resulting stretch marks. I came across this comic on a guitar forum and thought it was worth sharing.